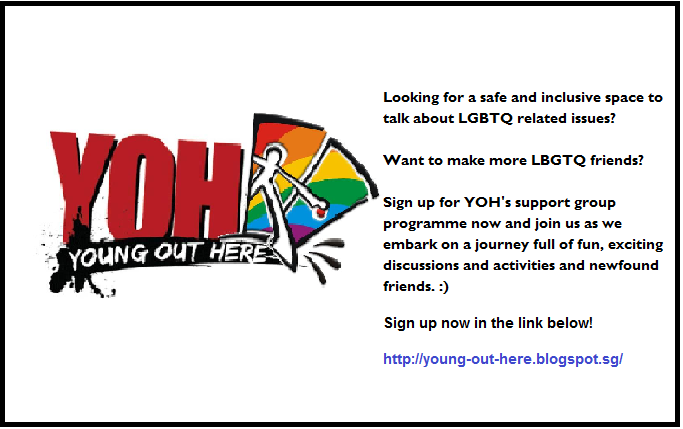 We've relocated our online presence from this blog to www.young-out-here.com! Looking for a safe, secular space to make new friends, discuss LGBTQ related issues AND have loads of fun at the same time? Look no further! Young Out Here is now opening up support group sign ups for youths aged 16 – 22 years old. Click on “Register your Interest with YOH” on the left to sign up now! As a community youth group dedicated to safeguarding the welfare of young LGBTQ Singaporeans, Young OUT Here is deeply disappointed with the High Court of Singapore’s decision to dismiss the constitutional challenge against Section 377a of the Penal Code. Such a decision would have an adverse impact on the wellbeing of young Singaporeans, many of whom face discrimination daily, in the form of teasing, bullying, and even outright physical abuse. Nonetheless, YOH and our allies remain committed to championing the safety and welfare of Singapore’s LGBTQ youth, in the hopes that Singapore will one day see them for the talented, unique individuals that they are. Getting picked on by classmates, being laughed at in NS, not fitting in with my friends - do things get better for me? Will it ever? If you want to explore such questions with other like-minded LGBTQ youths in a safe & inclusive environment, sign up for YOH's support group programme! Cason Crane: Climbing For LGBTQ youths! We sat down (not quite literally) before his lil trip here to Singapore and shared snippets of his life & motivations before this Friday's event. Introduce Cason Crane in ONE sentence. 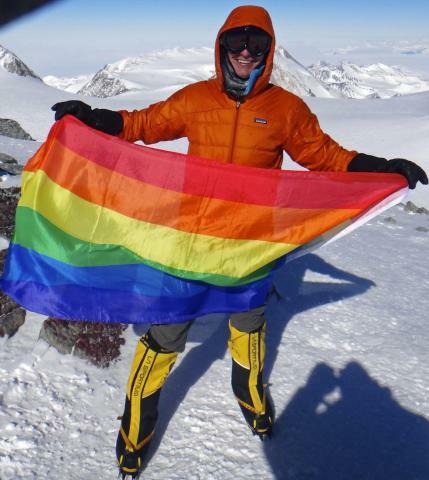 My name is Cason Crane and I'm a 20-year-old adventurer, mountain climber, and LGBTQ rights activist who is currently raising awareness for suicide prevention in the LGBTQ community by climbing the highest mountain on each continent. What were your motivations behind starting 'Rainbow Summits'? I wanted to use my personal initiative to climb the "Seven Summits" as a platform to raise awareness for issues facing LGBTQ youth. I was personally passionate about the issue of suicide prevention in the LGBTQ community, and so I recognized this opportunity to try to give back while also pursuing a lifelong dream of mine. Climbing & scaling mountains ain't easy and not to mention dangerous. What got you started? I got started mountain climbing when I was 15. My mother and I decided to pursue a fun challenge, and so we went and climbed Mt. Kilimanjaro, the highest mountain in Africa. Honestly, the moment I reached the summit of Kili, I was hooked. Something about the combination of an individual challenge, the beauty of the outdoors, and the internal reflection you get from being off the grid make mountain climbing a personal passion for me. I haven't looked back since! What made you decide to raise money for 'The Trevor Project'? I was motivated to raise money and awareness for The Trevor Project by the tragic death of a good friend of mine, and of Tyler Clementi, who was a gay student at Rutgers, a university in my home state of New Jersey. After Charlotte and Tyler's deaths, I knew that I needed to try to make a difference on this issue, and The Trevor Project was (and is) the only organization providing comprehensive suicide prevention and crisis intervention services to LGBTQ youth in the United States. Have you encountered any obstacles thus far? I have encountered many obstacles...far too many to recount here. 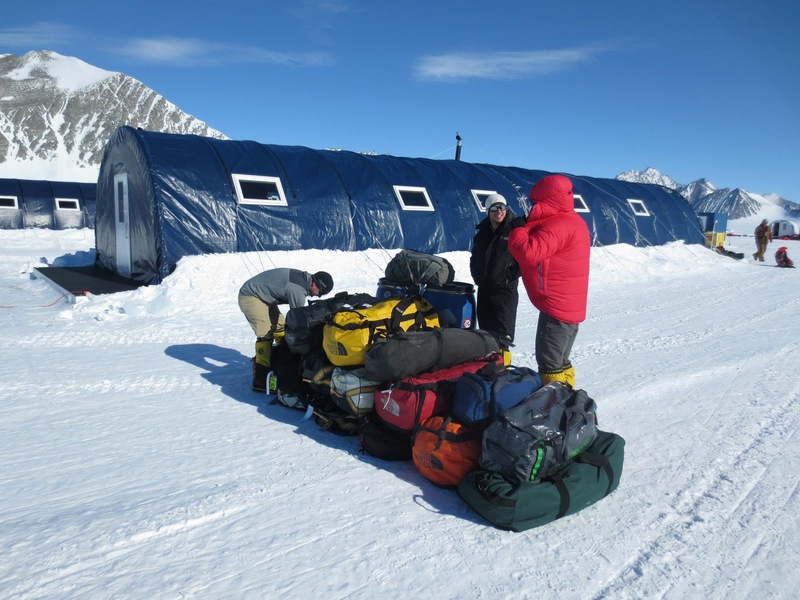 One of the things that make mountaineering such a compelling sport is that it requires more than just physical exertion. There is that, obviously, but it is also hugely mental, and requires a lot of preparation, planning, and logistics. Basically, that means you've got to be on your toes all the time and that you're faced with all sorts of difference challenges, even at times when you don't expect them. What's your greatest challenge yet? I would say that the most significant challenge I have faced so far was my period of internal reflection after I was unable to summit Denali (Mt. McKinley, the highest mountain in North America), last summer due to weather conditions. I had hoped that it would be my fourth of the Seven Summits, and I had to ask myself a lot of tough questions after I didn't make the top. "Could I complete my challenge?" "Do I have the mental and physical strength to keep going?" "What would this mean for my project and my fundraising?" were just a few of the many questions floating around in my head. In the end, I realized that even though I hadn't summited Denali -- even if I never was able to -- it would mean a lot more for me to keep going despite that setback because in reality it doesn't matter where on the mountain you end up as long as you know you've given it your all and tried your best. What have you taken away from it so far? I've taken away so many things...I mean to think of how much I've learned in the past year about the world, mountain climbing, public speaking, fundraising...it really runs the gamut. I would say my top take-away from the project is that I have learned that anyone and everyone can and SHOULD be an activist for some issue that they are passionate about. I am passionate about LGBTQ issues, and I am trying to do what I can to make positive change happen by contributing my unique interests and talents. If we all do this, the world will be a much better and happier planet. What are you looking forward to here in Singapore? I'm most looking forward to meeting and connecting with other young LGBTQ people in Singapore and talking about how they can climb their own "Everest," be it literal or metaphorical! © 2013 - 2014, Young OUT Here. Awesome Inc. theme. Theme images by moorsky. Powered by Blogger.